The glass catfish or Kryptopterus bicirrhis and its smaller relative the ghost catfish are native to Indonesia. They inhabit the large rivers and turbid waters of Borneo, Sumatra, the Malay Peninsula and the Chao Phrayaa and Mekongg drainage basins. They live near the shorelines in water with strong currents. They are diurnal predators (active in daylight) whose diet consists mainly of true water bugs in the wild. Glass catfish are some of the most unusual fish you can buy for a freshwater aquarium. Their bodies are totally devoid of scales and their skin and meaty tissue is completely transparent. You can see right trough to its bones and internal organs and out the other side of their bodies. As with all Catfish, they have barbells on either side of their mouths. Glass catfish have a docile temperament. They make good community fish as long as they are in the company of similarly mild mannered fish. Glass catfish are a medium sized fish. They grow to about four inches in length. They are mid-tank swimmers. The shoaling instinct runs extremely strong in these creatures. A glass catfish will not survive without another member of its own species in the tank. If you have two and one dies, the other will die shortly thereafter if you do not add another glass catfish to your tank. It is, therefore, advisable to keep at least four of them at a time. Glass catfish are every bit as fragile as their name. They have been known not to survive the trip home from the fish store. Once home, their chances of survival are significantly increased in a heavily planted aquarium. They are a shy species and will fare much better given plenty of places to hide. Glass catfish prefer neutral to slightly acidic water (pH 6.8-7.0). They are better suite for a water temperature a little cooler than some other tropical fish. The ideal temperature range is 70-79 degrees Fahrenheit. They function best in subdued lighting. And you want to have a filtering system that provides plenty of water flow to simulate the currents they are accustomed to living in. Under premium condition they have a life expectancy of 6 to 8 years. Glass catfish are egg layers. Attempts to spawn them in captivity have thus far failed. So the ones you see at the fish store have been recently removed from their native environment. They may very well suffer from escalated stress levels until they adapt to their new surroundings. Remember, these are not commercially raise fish. In the wild their diet consists primarily of true water bugs. They are carnivores that are accustomed to eating live food. In order to make help them adapt to their new environment you should start out by feeding them brine shrimp. Small insect larvae are preferable if you can find them. They will eventually learn to eat freeze-dried, frozen food and possibly even tropical fish flakes. But you still want to supplement their diet with live protein to insure their continued hardiness. These are, after all, rather delicate creatures. The mere mention of the word "saltwater" sends shivers up many freshwater aquarium owners' spines. In the past decade a new segment of the aquarium industry has been created for home aquarium owners; the Jellyfish Aquarium Fish Tank. Jellyfish aquariums are much easier to maintain than traditional saltwater tanks. Pet Moon Jellyfish look absolutely incredible under a fading LED lighting system. The Phantom Glass Catfish is often identified as Kryptopterus bicirrhis, but the ones offered for sale are more likely to be Kryptopterus minor, a similar but rather smaller species. Kryptopterus bicirrhis will grow to about 10 inches (25cm) long while Kryptopterus minor only grows to about 3 inches (8cm). The Phantom Glass Catfish is sometimes called the Glass Catfish, Ghost Catfish, or the Asian Catfish. There is a further possible confusion with the African Glass Catfish, Parailia pellucida, sometimes being sold as the Glass Catfish. The Phantom Glass Catfish comes from South East Asia including Thailand, Malaysia and Indonesia. It comes from streams with sluggish currents, often with areas of still water. In the wild the water this fish often lives in is cloudy with suspended sediments. In these conditions this transparent fish is very difficult to see; fish's transparency acts as an excellent camouflage. This is not a condition normally aimed for in a home aquarium. In an aquarium they will take neutral water (7). A temperature of 24 degrees C (75 degrees F) is suitable. We have no trouble with the moderate hardness of our Adelaide Hills water with this fish. The tank should be heavily planted. This fish is a predator. It will eat other fish up to the size of a newly born Guppy. More normal foods for it include mosquito larvae and Daphnia. I find that they will eat a normal, good quality fish flake without any trouble but I have seen reports of them being difficult to feed. The Phantom Glass Catfish is much more comfortable in a school of at least 5. 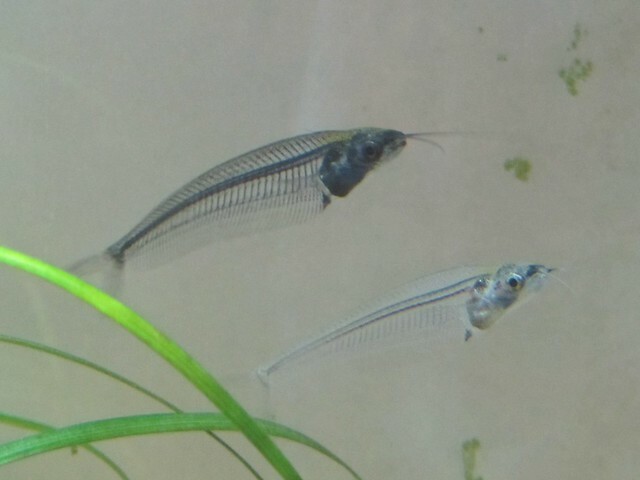 Although the Phantom Glass Catfish is a predator, it is peaceful to other fish as long as is cannot swallow them with its quite small mouth. They will certainly eat baby fish, but all reasonable sized adult fish, even small Neon Tetras, Cardinal Tetras and Green Neon Tetras are safe. Other suitable companions include Diamond Tetras, Splashing Tetras, White Cloud Mountain Minnows, Cherry Barbs, Penguin Tetras, Pristella Tetras, Glowlight Tetras, Red EyeTetras, Silvertip Tetras, Gold Barbs, Rummy Nose Tetras, Scissortail Rasboras, Lemon Tetras, Emperor Tetras, Head and Tail Light Tetras, Glass Bloodfin Tetras, Swordtails, Platies, Mollies, Zebra Danios, Black Widow Tetras, Rosy Barbs, Tiger Barbs, Paraguay Tetras, Buenos Aires Tetras and Colombian Tetras. They are also OK with Siamese Fighting Fish, Guppies and Endlers Guppies. It is claimed that in Asia techniques have been worked out for breeding the Phantom Glass Catfish. If this is so, I have been unable to find out the method. Possibly the commercial people who do this prefer not to tell possible competitors about their methods. There have been rare reports of the breeding of this fish and these suggestions are based on these reports. Feed well before hand with live food such as mosquito larvae. Simulate the start of the rainy season by daily partial water changes using soft water. Lower the water level and lower the temperature by about 2 degrees C (3 degrees F). The eggs, in the unlikely event that you succeed in getting any, are laid on plants, perhaps a couple of hundred from each female. The parents should be removed and the fry fed on small live food. The Phantom Glass Catfish is a major ingredient of some of the salty fish sauces used in Asian cooking. Unlike the great majority of the fish we sell, at least some of our Phantom Glass Catfish are caught in the wild. This fish is very common in some places and is not threatened. Do not release any pet fish into the wild, or keep them where they can escape.